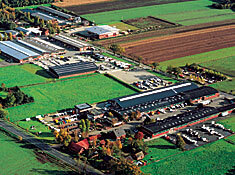 Böckmann Fahrzeugwerke GmbH, the premiere horse trailer manufacturer in Germany, hailed from humble beginnings. Starting as a farrier, Anton Böckmann was also a skilled mechanic for agricultural equipment. Initially building cattle transporters, he began to design horse trailers for family use. He built his trailers from the perspective of the horse, considering the design from the inside out. Now Böckmann is synonymous with quality and style in horse transportation across the globe. To read more about the building of the Böckmann family company - from stud farm to competition riders and trainers; from horse and commercial trailer manufacturing companies - to the elite truck division, click on the links below. Enjoy the journey! Horse Trailers "Made in Lastrup"